Another step in the new season took place this past weekend, as we move into deep stakes season and the promise of summer. One big piece of news, of course, is the situation in New Jersey, with the sport’s flagship track. The Meadowlands, since our last blog, has been officially taken over by the Jeff Gural team. A lot of familiar names returned to the track last week, as a few high-powered races also came home to roost. Our success along the way, almost included the Graduate Final. In the last steps of that race, however, Foiled Again defeated our choice, the 9-2 Bettor Sweet. The Meadowlands was not “playing” well to speed in late stretch over the weekend. Any strenuous action to take the lead meant serious loss of late steps for any horse caring to hold on at the wire. Also coming from off of a hot three-quarters was Slave Dream, who won the “Cutler” final. Our choice attempted to steal the race. Hot Shot Blue Chip, at 36-1, took control of the field early but was unable to maintain the tempo. At Pocono, the Max Hempt elimination, a single race to decide the field of next week’s soph-colt pacing final, was marred by a lot of jumping, which is not so common for soph pacers. The unlikely winner, Movie Idol, an honest 26-1 shot, took full advantage of mishaps from the beginning, when Smile A Little (refunded) and Pan From Nantucket (6-1) tangled and broke at the start. Horses were scurrying about to find good spots early and then had to readjust coming past three-quarters when our choice, Sharp West Hanover (36-1) broke and interfered with colts making aim for the finish line. The race was a mess and must be tossed out entirely when we address the final in our next blog. This was a poor showing for these new glamour-boy pacers, not a one of them that is coming from the top tier of last year’s frosh group. Meanwhile, we continue to find profits at Cal Expo. A repeat performance from two horses that we nailed in our Pick 4 last week in an odd dead heat, scored again, this time without the photo. Lucky Peterson came back to win, paying $25 and right behind him was Itza Free For All, the horse sharing winning honors last week. This exacta came back $47.60. Our Cal Expo Pick 4 finished 4th, 2nd/ 4th/ 4th, 3rd/5th. The Hambletonian Trail continues. You can go to the specific blog for previews and to the Hambletonian Society website for reports on eligibles’ results. The John Simpson Memorial splits at Vernon last Saturday went well for our choices, all of them eligibles to the August classics for colts and fillies. Watch for more action on Tuesday, May 17, when three splits of Pennsylvania Sires Stakes that involve Hambo eligibles, go at the Meadows. Follow the Hambletonian Trail blog for all previews, picks and insider information. The glamour-boy pacers featured the return of Feel Like A Fool, debuting at three in a John Simpson Memorial at Tioga. Our old friend Howard Parker was aboard the George Teague, Jr.-trained frosh champ (pictured left). The win was a convincing 1:54 over a “sloppy” track. Remember He’s Gorgeous, a soph-colt pacer from last season that picked up some mighty checks behind horses like Rock N Roll Heaven and who had a good late-season kick? Last Saturday, the Tracy Brainard-trained horse, now four, soared in the feature race at Saratoga. 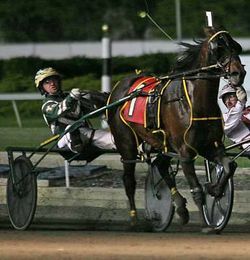 With Dan Cappello, Jr. in the bike, “Gorgeous” was coming off a lifetime mark of 1:50 at Vernon Downs the week before. On the Saratoga half-mile he followed that up with a 1:51.1 victory. That time is a tick off the all-time track record at Saratoga. The record of 1:51 was set by Rare Jewel in 2006 and has since been matched by Gimmebackmybullets and Joey The Czar. Rare Jewel was among the pacers defeated by Gorgeous in Saturday’s event.